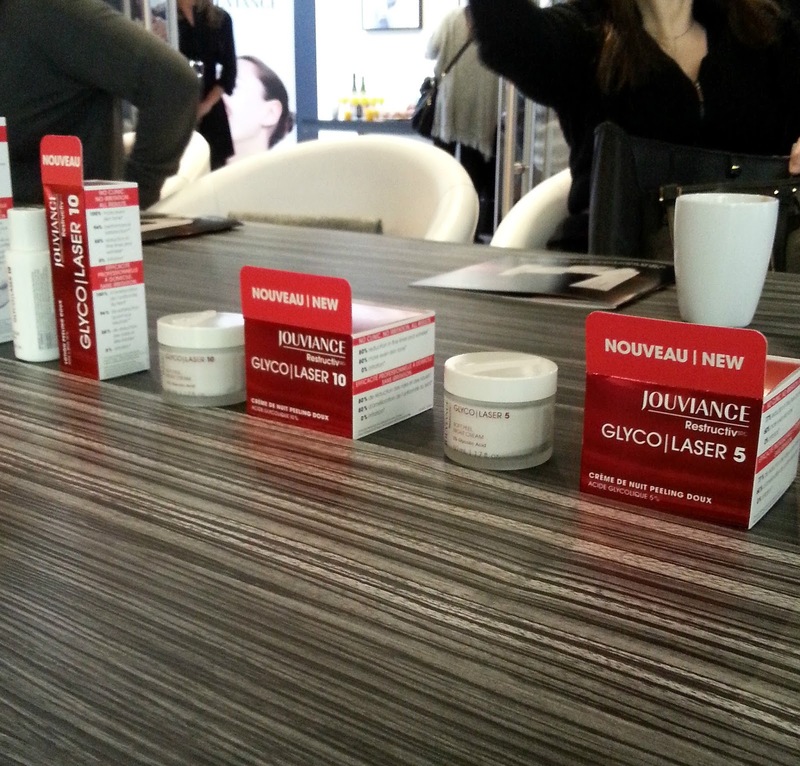 A couple of months ago, Jouviance invited me to their head office in Montréal to discover their new Restructiv Glyco | Laser line and hear more about the star ingredient that is glycolic acid. 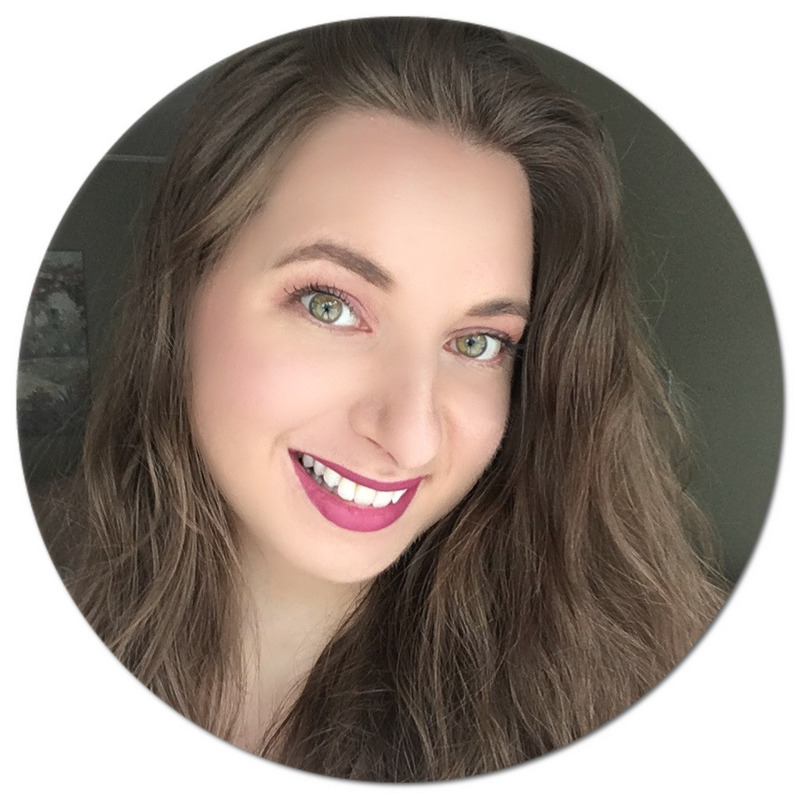 I had previously tried some products from Jouviance's makeup line (more on that here) which left me really impressed, as you can probably tell from this video. 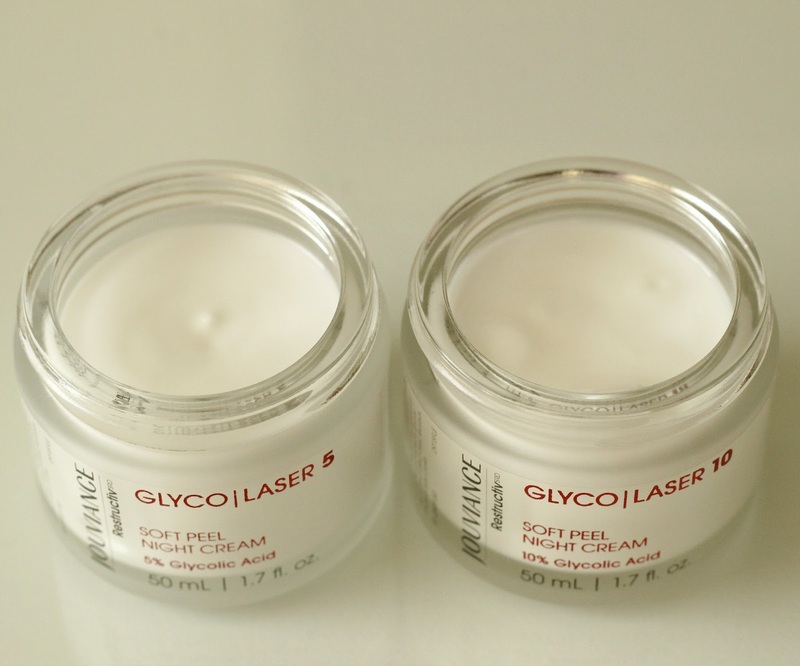 I've heard amazing things on the power of glycolic acid, so I was really looking forward to learn more about it. 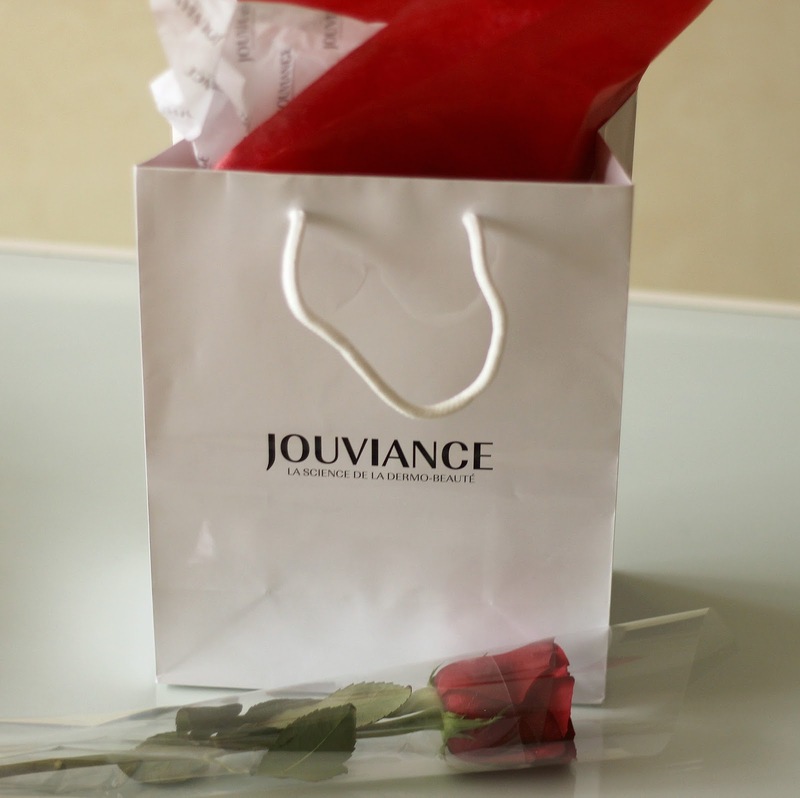 Following the presentation, we were sent home with a red rose (how lovely!) and a swag bag filled with their new skin care products, including the Glyco | Laser Soft Peel Mask 5% Glycolic Acid*, Soft Peel Night Cream 5% Glycolic Acid*, Soft Peel Lotion 10% AHA + BHA* and Soft Peel Night Cream 10% Glycolic Acid*. I was a little apprehensive to apply these more concentrated acid formulations on my face, so I'm here to share my experience with you after using them over the last few weeks. Before diving into the products, I thought I would start by sharing what I learned about glycolic acid - it surprisingly isn't rocket science, just stay with me! So what exactly is glycolic acid? Glycolic acid is part of the AHA (or alpha-hydroxy acid) family, which includes ingredients that have been found to effectively resurface the top layer of the skin through exfoliation to help fight the various signs of aging. It is considered one of the safest acids to use, since its small molecular size makes it easy to penetrate deep inside the epidermis to lift dead skin. It has been shown to repair damaged cells caused by fine lines, wrinkles and even dark spots and hyperpigmentation due to sun exposure. 5. Improves the performance of other products through better penetration and absorption. 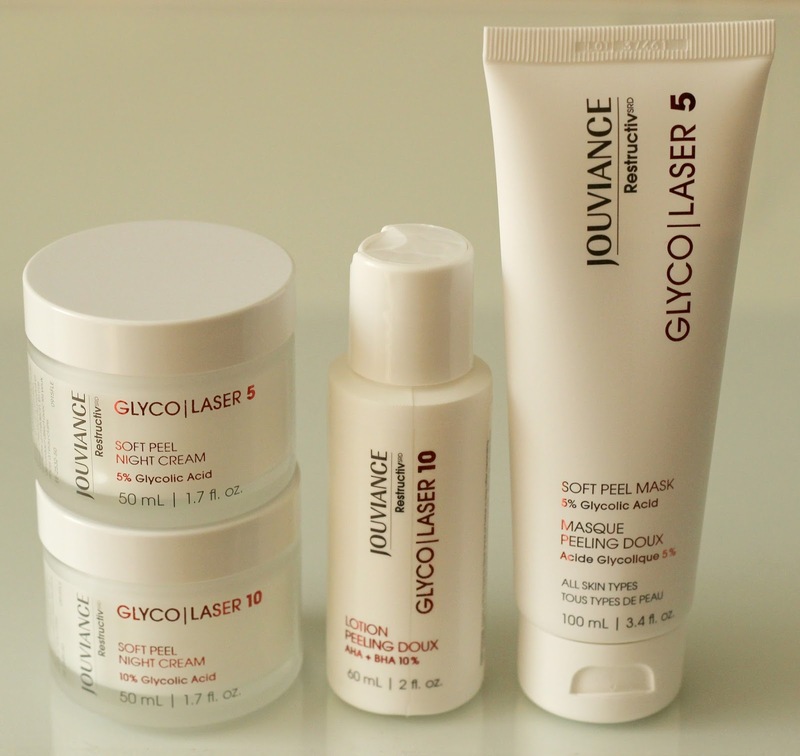 The maximum percentage of glycolic acid allowed in over the counter skin products in Canada is 10%, hence Jouviance came out with two products with a 5% concentration (great first-use options to see how your skin will respond to the acid, especially if you have sensitive skin) and two with a 10% concentration of glycolic acid. I first tried the Soft Peel Mask 5% Glycolic Acid which I use 2-3 times a week, followed by the Soft Peel Night Cream 5% Glycolic Acid which I use every night. Peeling masks have always scared me, but trust me when I say this one is extremely gentle, as in you don't actually see your skin peel off. I simply leave it on for 10-15 minutes and rinse it off, that's it! Both nights creams are safe for nightly use (although you should only use one at a time). I was a bit alarmed when my face turned a bit red right after applying the 5% cream, but this is normal and the redness faded after only a couple of minutes. The following week I bumped it up to the Soft Peel Lotion 10% AHA + BHA (aka beta-hydroxy acids, which includes salicylic acid known to decrease sebum production, deep clean pores, treat acne and fade scarring) and the Soft Peel Night Cream 10% Glycolic Acid. Again, my skin became slightly red but I knew this time that it would fade quickly, which it did. I use only one of these on a given day since I do not want to overdue it and not overstimulate my skin. Also worth mentioning is that all four of these products have the same pleasant, delicate scent (other ingredients include hyaluronic acid, jojoba seed oil, aloe vera, vitamin E and shea butter) and feel very light on the skin, with the night creams having a gel-like consistency and absorbing very quickly. I have noticed a substantial difference in the overall texture of my skin in these past few weeks. It looks more even and smooth, is less inflamed and has a nice glow to it. My scars seem to be healing more quickly than ever and I can see that my sun spots are becoming lighter too. I'm shocked by how quickly I've noticed these changes too - it is truly amazing! I am such a fan and finally understand why glycolic acid is so highly praised as an ingredient in skin care. 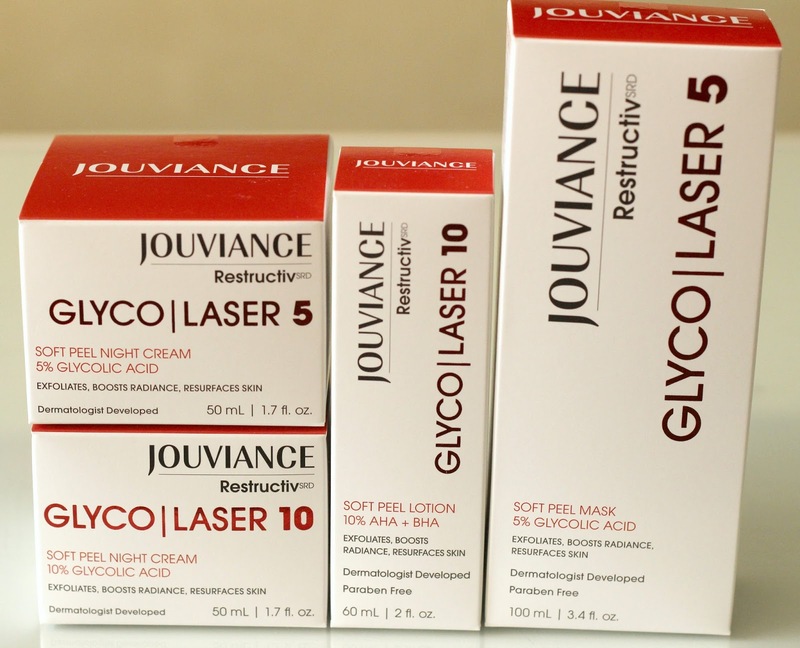 The Jouviance Restructiv Glyco | Laser line is now available exclusively at Pharmaprix and online, with each product retailing for C$40.00. Have you incorporated glycolic acid in your skin care routine? These all sound wonderful. I'm intimidated by most peeling masks and haven't used gylcolic acid on a regular basis. I'll have to check out the soft peel mask though! Thanks! I finally found someone who mentioned how often they used the night time glycolic peel cream... I'm guessing if I use it every night, I'll see more results than using it once in a while.